Six years ago I raved about this new company called Organic Climbing and its flagship crashpad, the Full Pad. Since then, a few features on the Full Pad have been tweaked, but the main features that make it one of my favorite landing zones remain. 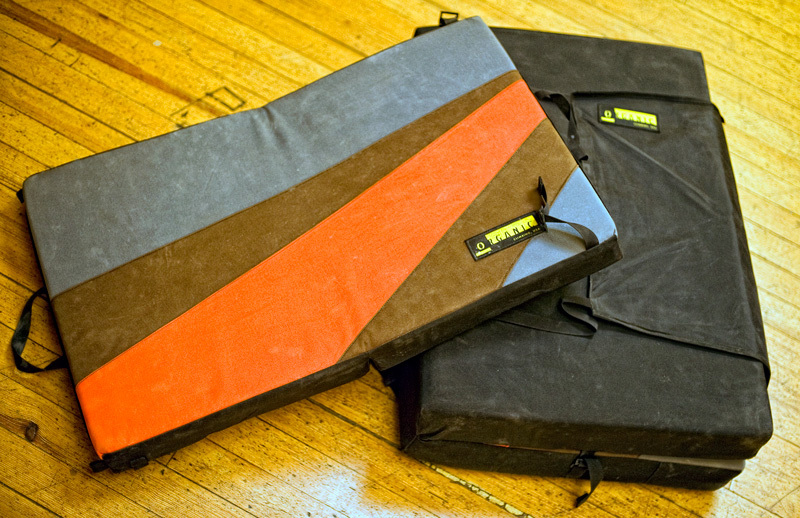 Six years ago I raved about this new company called Organic Climbing and its flagship crashpad, the Full Pad. Since then, a few features on the Full Pad have been tweaked, but the main features that make it one of my favorite landing zones remain. It’s all about the foam, which is wrapped in heavy-duty ballistic nylon. 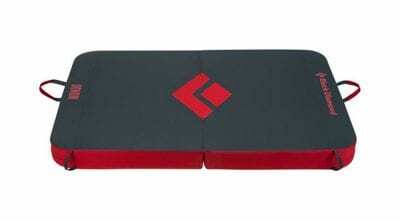 Three inches of soft foam sit beneath one inch of dense, hard, high-impact-absorbing foam. Traditionally, pads fold up in either “hinged” or “taco” style—the former type using separate squares of foam hinged together by fabric, while the latter is a single swath of foam that you bend in half, like a taco. Both designs have their pluses and minuses. The Full Pad merges these two worlds with its “hybrid hinge” design—the bottom three inches of foam are hinged, while the inch-thick top deck is a single sheet that folds taco-style. The result is better protection from punching through the crease, while the pad remains easy to fold in half. 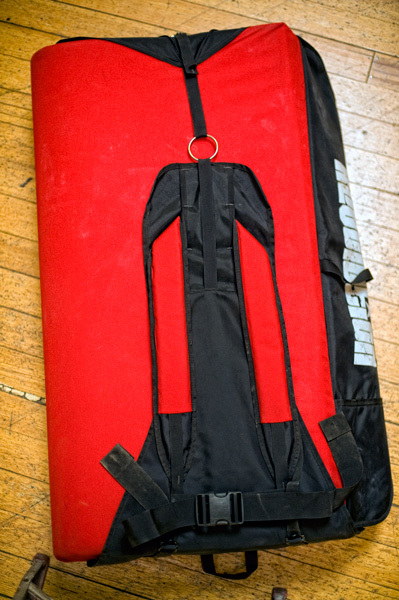 Also new this year, the Full Pad’s wide, velcro closure straps have been lengthened to accommodate the Organic Briefcase—a little three-inch-thick sub-pad that really comes in handy to protect sit starts, cover a jagged protrusion off to the side of the main landing zone, or just fill in a gap. Obviously, it’s nice to have an extra kicker around, and getting one to the boulders has never been easier. On the minus side, it’s hard to pack climbing gear, clothing, food and water into the Full Pad. The pad folds shut so tightly that it’s difficult to cram your stuff in there. Also, someday I’d love to see the addition of water-bottle pouches on the pad’s exterior. Not only would that be nice for long hikes, but my water bottles wouldn’t drop out of the bottom of the pad. Overall, this Full Pad/Briefcase combo is actually quite compact—nice for navigating tight spaces (such as between trees and through Hueco tunnels), and fitting in cars. Both pads together weigh 16 pounds, which is lighter than most “mondo”-sized pads but not as light as other full-sized pads. However, due to the extra protection afforded by having two pads, I was more than happy to lug this extra weight—even on hour-long hikes at 12,500 feet.